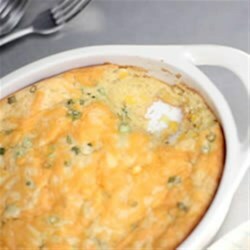 "This light corn souffle with lots or corn and cheese is easy enough for weeknights and fancy enough for guests." Pour into 2-qt. casserole sprayed with cooking spray; top with Cheddar. Bake 45 to 50 min. or until knife inserted in center comes out clean. See how to make an impressive, surprisingly easy, marbled pumpkin cheesecake. Add 2 sliced green onions to batter before pouring into prepared casserole. Prepare using PHILADELPHIA Spicy Jalapeno Cream Cheese Spread. Tasted great. Needs more cooking time. I baked mine for one hour and turned out perfect. Kids loved it!! This corn souffle was ok. We have been on a corn bread kick lately and this is not one of the better recipes that we have made. Won't be making again. Mine took a little longer to bake, but it was likely the pan I made it in. Family loved it and so simple to make. Loved this recipe! Brought to pot luck dinner and had many positive responses. The dish was empty so it must have been good. Many people requested the recipe.